This evening Michelle and I took off for an evening of culture. 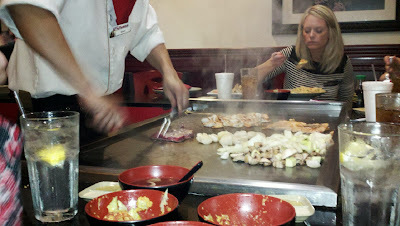 We started with a Hibachi dinner at Fujiyama Japanese Seafood & Steak. We haven't enjoyed the showmanship that goes with a Habachi dinner for a long time. We both had the Steak and Salmon combination. 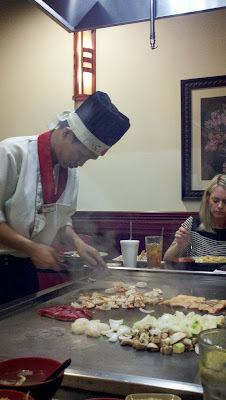 Dinner was good but I'm not going to claim this to be a once in a lifetime dining experience. Our main event of the evening was a concert by Jackie Evancho at the King Center in Melbourne, FL. Here is a bit of her bio from Wikipedia. Tonight she was great. I kept hoping to hear Nessun Dorma. I felt sure she would do it as an encore–she had three. But alas that was not to be. She did, however sing O Mio Babbino Caro (English:"Oh My Beloved Father") a soprano aria from the opera Gianni Schicchi also by Giacomo Puccini. Click here for an earlier performance.